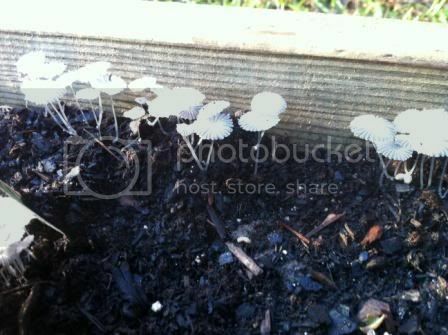 I've found this fungus in my garden. Nothing was in there yesterday, this morning I found what is in this picture and by this afternoon it was dead and shriveled up. What is it? Is it harmful to my garden? How can I get rid of it? Some kind of mushroom-y thing. Looks like you have wood chip mulch? Mushrooms love wood chips. It is not harmful to your garden and you don't need to get rid of it. It is helping break down the wood chips into soil nutrients. 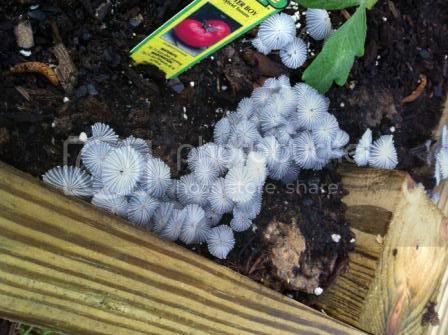 It does mean your soil is pretty damp; mushrooms thrive in very damp humid conditions. That may mean you are keeping it a little too damp for your plants, depending on what kind of plants you are trying to grow. If you let it dry out, the mushrooms will go away. Can you identify this fungus on the stump? Halp! Need to identify... fungus?